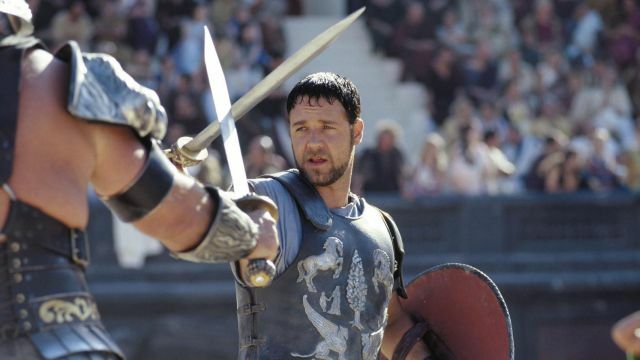 Russell Crowe’s Gladiator armour is among some valuable props the acclaimed actor will auction five years after his separation from ex-wife Danielle Spencer. The auction sale entitled ‘The Art of Divorce’ at Sotheby’s Australian branch will contain 223 items including Spencer’s ring, valued at A$100,000 (£56,000). In a recent interview with the Australian Daily Telegraph Crowe said “we’ve been separated over five years now, our divorce should be finalised around the time of the auction. Just as we collaborate on the upbringing of our kids, it’s easy for us to work together on something like this.” The total sale is estimated to make A$3.6 million (just over £2m). Sotheby’s image of the cuirass for sale. Yates also revealed a fascinating feature of the armour you probably didn’t notice. “As maximus succeeds fight after fight he adds another figurine to the breastplate. The breastplate is made of hardened black leather and the pieces are made of facsimile silver. The idea of the additions to the cuirass was Russell’s own idea. He talked it over with Ridley and they both thought it was a lovely thing,” she said. Examining the image of the cuirass for sale it appears to be from the very end of the film owing to its complete set of figurines and segmentata shoulder plates. Notice in the header image at the top of this article the small winged figurine on the right is missing and Crowe has no shoulder plates. Perhaps it would be best to just find a replica by seeing what Ebay and Etsy have to offer. Have you seen Ebay’s Roman costume category?